Foreword. Preface. List of contributors. List of abbreviations. Part I: Flow Injection Analysis: A Versatile Sample Introduction System for Atomic Spectrometry. 1. FIA-atomic spectrometry: A synergic combination for chemical analysis (J.F. Tyson). 2. Basic instrumentation for FIA-atomic spectrometric detection (R. Pereiro). 3. FIA techniques and strategies expand the potential of atomic spectrometry (J.F. Tyson). 4. FIA strategies for calibration and standardization in atomic spectrometry (M. de la Guardia). Part II: Flow Analysis: A Convenient On-Line Sample Pretreatment Strategy for Atomic Spectrometry. 5. Flow injection systems for on-line dissolution/decomposition (J.L. Burguera, M. Burguera). 6. Flow injection on-line solid-liquid separation and preconcentration atomic spectrometry (Zhao-lun Fang, Guan-hong Tao). 7. Flow-injection on-line liquid-liquid separation and preconcentration atomic spectrometry (M. Valcárcel, M. Gallego). 8. Flow methods in gas-liquid separations (J. D&ecaron;dina). 9. Continuous aspiration and flow injection in atomic emission plasma spectrometry (A. Sanz-Medel, J. Enrique Sánchez Uría, A. Menéndez García). Part III: Applications of Flow Analysis with Atomic Spectrometric Detectors. 10. Applications in environmental analysis (A. Morales-Rubio, M. de la Guardia). 11. Applications of flow analysis with atomic spectrometric detectors in clinical and biological analysis (R. Pereiro, A. Sanz-Medel). 12. Cryofocusing for on-line metal and metalloid speciation in the environment (A. de Diego, C. Pécheyran, C.M. Tseng, O.F.X. Donard). 13. Chromatographic separations coupled to atomic detectors: Trace element speciation in biological systems (A. Sanz-Medel). 14. Microcolumn field sampling and flow injection analysis: A strategy for enhanced trace analysis and element speciation (R. Ma, G. Woods, C.W. McLeod). Index. Flow Analysis (FA) offers a very convenient and fast approach to enhance and automate 'preliminary steps' of analysis (sample dissolution, pretreatments, preconcentrations, etc.) for atomic spectrometric detectors (ASD). Moreover, flow manifolds can ease the well-known problem of sample introduction/presentation to atomisers or even expand the classical scope of atomic/elemental information, characterizing atomic spectrometry, into the realm of molecules and metal-compounds analysis (e.g. by resorting to coupled separation techniques). All these facts could explain both the extraordinary interest for research and the great importance for practical problem-solving achieved nowadays by FA-ASD. Part I gives the fundamental, instrumentation and potential of FIA as a most versatile sample presentation/introduction system for atomic spectrometry. Part II provides a modern account of fundamentals, possibilities and applications offered by flow analysis to atomic spectrometry for on-line sample pretreatments, separations and preconcentrations. Part III deals with applications of FA-ASD combinations to analytical problem-solving in most varied fields and situations. 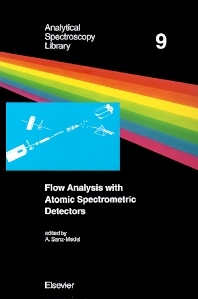 This monograph integrates the most popular aspects of FIA, its new developments for sample on-line treatments and on-line non-chromatographic and chromatographic separations (all typical 'flow analysis') in connection with all branches of analytical atomic spectrometry. Thus, academics, researchers and routine users of analytical atomic spectrometry will find this book invaluable.